Gold prices were lower in Asian trade on Wednesday as investors digests strong remarks from President Donald Trump and turned their heads to a fresh batch of economic data. Trump’s speech covered it all but didn’t go in details too much. The republican leader insisted that illegal immigration should be controlled, justifying the construction of a wall on the border with Mexico. He also said his team is developing a “historic” tax plan that will allow American companies to compete anywhere in the world, while providing with massive relief for middle class. Defense and infrastructure spending are also priorities for Trump, and he assured next budgets will reflect that. He even said a new healthcare program is on its way. On the Comex division of the New York Mercantile Exchange, gold for April delivery fell 0.44 percent to trade at $1244.20 a troy ounce as of 07:05 GMT. The yellow metal traded mostly lower on Tuesday’s session, as the dollar recovered ahead of President Trump address to the US Congress. Market sentiment was also affected by key economic reports. The gross domestic product rose 1.9 percent in the last three months of 2016, falling short of a 2.1 percent increase seen. The Conference Board also said that consumer confidence in the United States came in at 114.8 points in February, surpassing an expected 111.0 points. Today, data continues to be in focus. Core PCE Index and Personal Spending are due at 13:30 GMT, while Markit’s Manufacturing PMI for February will be out as of 14:45 GMT. Analysts are foreseeing 54.4 points. The Institute of Supply Management is expected to present its February manufacturing PMI at 15:00 GMT. Market players will also keep their eyes wide open in search for hints on the timing for the next Fed rate hike as two FOMC officials will be speaking on this session. President of Dallas Fed Robert Kaplan is due at 18:00 GMT, while Fed Governor Lael Brainard comes at 23:00 GMT. According to CME Group’s Fed Watch Program, odds for a March rate hike currently stand at 40 percent, up from a previous week 23 percent as Fed Chair Janet Yellen said it would be better to raise benchmark rates sooner than later. Crude prices were flat in Asian trade on Wednesday as US President Donald Trump’s speech before the Congress didn’t cover an energy plan to boost local production. US West Texas Intermediate oil futures traded at $53.99 a barrel on the New York Mercantile Exchange, down 0.06 percent from its previous settlement. The London-based Brent crude oil futures were up 0.02 percent to trade at $56.52 a barrel as of 07:05 GMT. Oil benchmarks settled lower on Tuesday as concerns regarding a larger US shale production weighted on market sentiment ahead of official inventories from the Energy Department. On Tuesday, the American Petroleum Institute reported a build of 2.5 million barrels in crude inventories last week and 1.84 million barrels for gasoline. Distillates dropped by 3.73 million barrels and Cushing oil increase by 544,000 barrels. 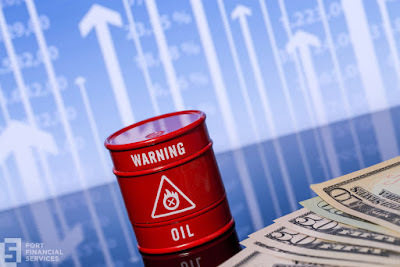 The US Energy Information Administration is expected to release its weekly crude stockpiles report at 15:30 GMT, with expectations pointing at a 3.079 million-barrel build for the week ended February 24, following a prior increase of 564,000 barrels. A survey conducted by Reuters also said compliance level of the OPEC-led output cuts stands at 93 percent in February, supporting the crude as investors received news as evidence that oil producers are serious about pushing prices higher.